There are many possibilities for festive holiday displays with this great project. Some evergreen candles on one side and a bowl of seasonal nuts on the the other could make for a nice layout on a coffee table, sofa-back table, or bar/counter-top. 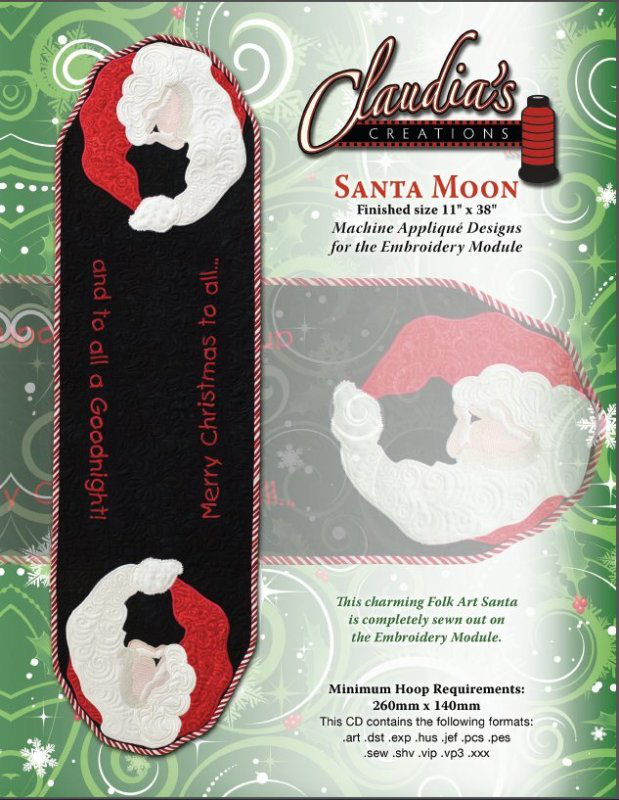 The Santa Moon Table Runner has a finished size of 11" X 38". Digitized for 3 sizes Large, Mega and Jumbo hoop. The minimum required hoop and grid size is 10.25" X 6". CD-ROM contains the design files in multiple formats, tutorials, and templates. Printed on the package are the fabric, embroidery supply, and sewing supply lists.